Take a look at some of the highlights from our District and see what's ahead. Be sure to stay tuned to www.Crandall-ISD.net to get all the information about Crandall ISD news and upcoming events. Stay up to date by following us on Twitter (@OfficialCISD). 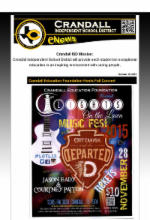 Welcome to the Crandall ISD eNews update! We are excited to share some upcoming events including the Lights On the Lawn Music Fest 2015! Be sure to continue to share your favorite school photos to @OfficialCISD on Twitter and follow along with the fun. Click here to view the October 15th eNews. In its efforts to promote nondiscrimination, the Crandall Independent School District does not discriminate on the basis of race, religion, color, national origin, gender, or disability in providing education services, activities, and programs, including vocational programs, in accordance with Title VI of the Civil Rights Act of 1964, as amended; Title IX of the Educational Amendments of 1972; and Section 504 of the Rehabilitation Act of 1973, as amended. The following district staff members have been designated to coordinate compliance with these legal requirements: •"Title IX Coordinator, for concerns regarding discrimination on the basis of gender: Assistant Superintendent of Human Resources, Crandall ISD, P.O. Box 128, Crandall, TX 75114, 972- 427-6000. •"Section 504 Coordinator, for concerns regarding discrimination on the basis of disability: Director of Intervention Services, Crandall ISD, P.O. Box 128, Crandall, TX 75114, 972-427- 6000. •"All other concerns regarding discrimination: See the Superintendent, Crandall ISD, P.O. Box 128, Crandall, TX 75114, 972-427-6000.